(1) It increases in sebum secretion. (2) Acne thickening of the keratin lining of the sebaceous duct, to produce blackheads or comedones. 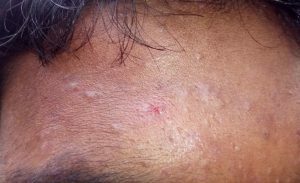 (5) It inflammation around the sebaceous gland. 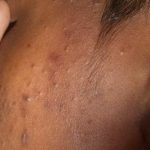 Nearly all teenagers have some acne (acne vulgaris). It affects the sexes equally, starting usually between the ages of 12 and 14 years, tending to be earlier in females. The peak age for severity in females is 16–17 and in males 17–19 years. Variants of acne are much less common. Boys are more commonly affected than girls. Retinoids and retinoid-like drugs. This medication can apply in the evening, beginning with three times a week and then daily as your skin becomes used to it. It works by preventing plugging of the hair follicles. Antibiotics. These work by killing excess skin bacteria. For the first few months of treatment, you may use both a retinoid and an antibiotic, with the antibiotic applied in the morning and the retinoid in the evening. Antibiotic use by their regimen & short period of time. Topical antibiotics alone aren’t recommended. Salicylic acid and azelaic acid. Salicylic acid may help prevent plugged hair follicles and is available as both wash-off and leave-on products. It’s even more effective when used in combination with erythromycin. Studies showing its effectiveness are limited. Dapsone. Dapsone (Aczone) 5 percent gel twice daily is recommended for inflammatory acne, especially in adult females with acne. Antibiotics. For moderate to severe acne need oral antibiotics.. Usually the first choice for treating acne is tetracycline — such as minocycline or doxycycline — or a macrolide. Oral antibiotics should be used for the shortest time possible. Combined oral contraceptives. Four combined oral contraceptives are approved by the FDA for acne therapy in women. They are products that combine estrogen and progestin. You may not see the benefit of this treatment for a few months, so using other acne medications with it the first few weeks may help. Anti-androgen agents. The drug spironolactone may be considered for women and adolescent girls if oral antibiotics aren’t helping. It works by blocking the effect of androgen hormones on the sebaceous glands. Isotretinoin. 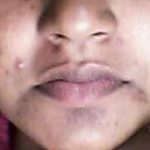 Isotretinoin is a powerful drug for people whose severe acne doesn’t respond to other treatments. But it need closely monitor. These are use for selected cases with combination medications. Extraction of whiteheads and blackheads. If a child has acne, consider consulting a pediatric dermatologist. Twice a day, use hands to wash face with a mild soap and warm water. If acne developed around hairline then shampoo every day. Gentle shave affected skin if needed. Salicylic acid, glycolic acid or alpha hydroxy acids may help for mild and moderate acne. Avoid irritants like: oily or greasy cosmetics, sunscreens, hairstyling products or acne concealers. Protect your acne-prone skin from contact with items such as phones, helmets, tight collars or straps, and backpacks. Avoid touching or picking at the acne areas. You should see your doctor if you have moderate or severe acne. 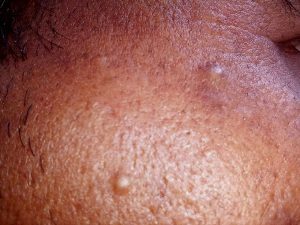 To treated properly to avoid scarring for developed nodules or cysts. Treatments can take up to 3 months or more. So don’t expect results comes shortly.